There seems to be more cases of Lyme Disease you hear about all the time. It is quite misunderstood and not known how to deal with it in Western Medicine. I was bit by a tick 6 years ago and supplemented it naturally with no severe reactions from the bite. Now in my practice with the Linear Bio Resonance testing it can pick up on Lyme or any other bacteria, or parasite that is in the body and reveals the parts of the body it is affecting. So my hope in writing this blog is to help you better understand Lyme disease and realize you can get help. Lyme disease was named after the east coast town of Lyme, Connecticut, where the disease was first identified in 1975. The disease was first referred to as Lyme Arthritis, due to arthritic symptoms. By 1977 the blacked legged tick, known as the deer tick, was linked to the transmission of the infection. The blacked legged tick has 3 life stages which are the Larva, Nymph, and adult. The Nymph is the size of a poppy-seed and the adult is the size of a sesame seed. They feed off the blood of animals such as rodents, small mammals and white tail deer and even our pets. 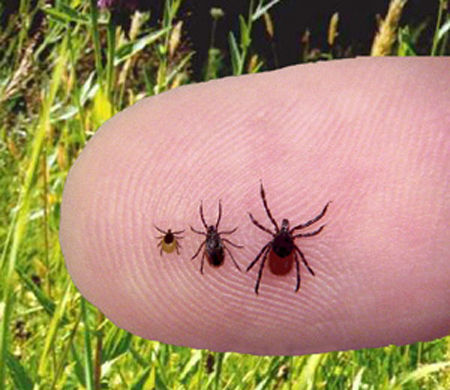 Not all ticks carry the bacteria but they pick it up from infected rodents, birds and white-tailed deer. The blacked legged tick can not jump or fly. Instead they seek host by climbing on vegetation such as grasses or shrubs and waiting for the host to rub against them. When this happens they climb on the host body and eventually attach and feed on their blood slowly over periods of days. You can be the host to the Lyme bacteria but you may never see the tick that bites you. This is because they are so small as well as the tick numbs your skin so you won’t feel it. It prefers dark crevices such as your armpits, behind ears, naval or your scalp. The bacteria are released into your bloodstream from the infected tick by their saliva. The only unique distinction to Lyme disease is the bull-eye rash with expanding red ring. However some people who test for Lyme disease have not noticed this bull eye rash. It is quite often misdiagnosed because it mimics other diseases. Some of the first symptoms may include flu-like symptoms with fever, chills, headache, stiff neck, ache all over, and fatigue. Usually they can test you to see if you have been bitten and give you antibiotic. If the tick isn’t removed or the antibiotics don’t work it can cause more severe symptoms, such as extreme muscle stiffness and joint pain, neurological problems, heart problems, vision & hearing problems, migraines. There are four common tests which can be done to diagnose Lyme disease. Although these test can yield false-negatives since the Lyme bacteria are very sparse and may not be in the test sample. If you have Lyme disease, fibromyalgia, chronic fatigue, autoimmune disease, or possibly any other chronic illness, there is a microbe you should know about. Mycoplasma is the smallest of all bacteria, which 4,000 can fit inside one red blood cell in your body. It is a parasite that cannot live without a host. Unlike other bacteria, mycoplasmas do not have a protective cell wall. The interesting strategy of survial allows them to change their shape and fit into areas where other bacteria cannot go. Not having a cell wall they can travel any part of the body which makes mycroplasma completely resistant to many types of antibiotics. Mycroplasma are spread by biting insects like ticks, mosquitoes, fleas, biting flies as well as sexual contact, contaminated foods, and airborne droplets. There are 23 different types of mycroplasma that can infect humans. A few of them are considered harmless normal flora, but most have the potential to cause disease. You can check out the website Vital Plan.Com. Bill Rawls was a medical doctor that was bit by a tick and did much research and was able to get well with alternative therapies. It is important to change your life style and eating habits plus take supplements. However, this is a microbe borne disease so it is imperative to treat it with a powerful agent that can control the progression of the disease. I have found for me that was Allimax. Allimax is 100% stabilized allicin that has been proven to be effective against drug resistant bacteria. I have been able to help many people through the years with this amazing product so it is available in my clinic.